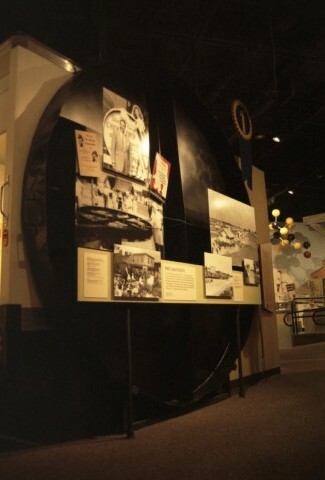 The World's Largest Frying Pan was originally produced for use at the DelMarVa Peninsula Annual Chicken Show and Feed. Currently on display at the Historical Society in downtown Wilmington, this was one of the World's Largest Things I had just heard of through the grapevine. I knew of its existance, but had no idea where DelMarVa was. Well, DelMarVa is a contraction of Delaware, Maryland, and Virginia, and the festival took place in various locations in the region refered to as the DelMarVa Peninsula. The pan would therefore move around, also, but just so happened to land in the very town in which I was making inquiries. Background information was a little more difficult, but I tracked down some generalizations from the Historical Society and some specifics at the Library. And, it's darn close, scale-wise, to the Washington pan... Both were used in local foood festivals, both have been discontinued, the Wilmington one on display is the real thing, the Long Beach one is a replica. Once again, it's up for you, the surfer, to decide. In 1948, the Atlantic and Pacific Tea Company sponsored a contest to breed the best broilers. From this came the Delmarva Chicken Festival. 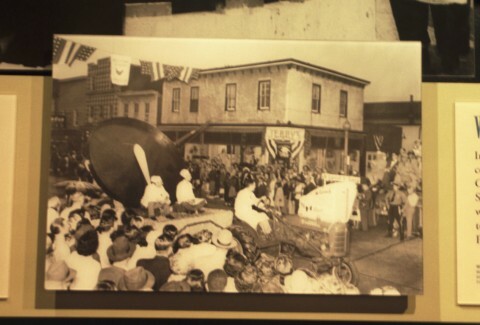 In 1950, the Mumford Sheet Metal Works in Selbyville manufactured this ten-foot-diameter frying pan, the world's largest, for the contest. After cooking over one hundred tons of chicken, the festival retired this pan in 1998. Delmarva Poultry, Inc., continues the festival to this day.